Yesterday was a pretty typical Minnesota winter day here. Cold, icy, grey. We had been outside, we had been inside but we were all still in need of some movement. So, we grabbed our play silks. And over the next hour Nora, Gus, and I giggled out faces off as we watched steaming colors fall from the sky. And as we played, I really started to think about how much I have come to appreciate and love play silks. They were the perfect, colorful, warm antidote to an otherwise dull day. I didn't always understand the beauty of play silks. What were they for? Why did we need them? Couldn't the kids just use blankets to play? Aren't these just expensive pieces of fabric? But, I tried them because so many people said they were amazing. And, what do you know, I'm a believer now too! They actively engage my kids in all sorts of activities and are use so often here. And, they are one of those open ended toys that can be safely used by children of a bunch of different ages which I super appreciate! We've built our collection slowly over the last couple years and they have become one of the most used toys. Play silks, how do we use them? Maximum effort and movement - you read that right! It takes a surprising amount of effort to throw these light flowy silks into the air. They move sort of erratically as they fall leading to all sorts of movement. This is what we spent so much time doing yesterday. Throwing and catching. Gus, in particular, loves this game. Peek-a-boo - Gus still enjoys this a bit, but he's getting old for it. But as a baby, play silks make great peek-a-boo covers. See more on babies and play silks here. 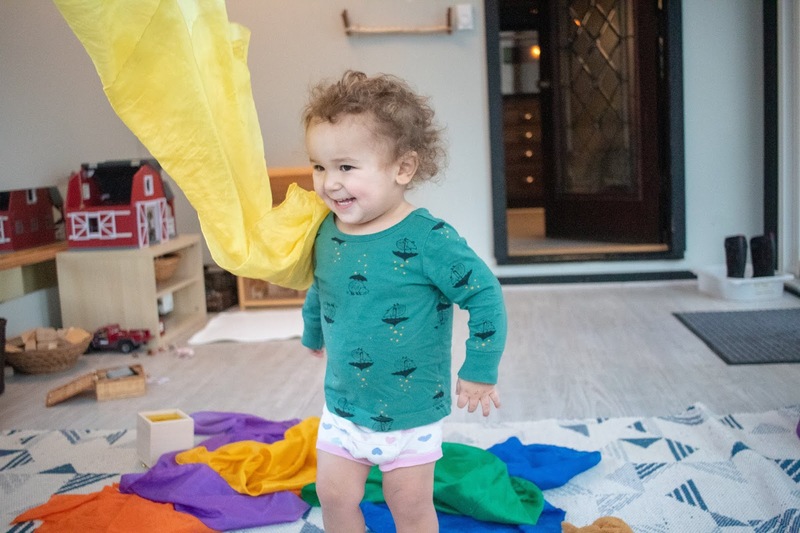 Sensory type play - put a bunch in a bin or box and let all the sensory play happen, sensory play doesn't have to just be hard objects, but soft and silky works too! Dress Up - I have basically replaced all our dress up costumes (we didn't have that many anyway) with these. Play silks can be anything from a cape, to a shirt, to a skirt and tie. And they tie and untie so easily so the kids imagination really drives this play instead of a costume with one specific use. Fort Building - We use to use big blankets to make forts but those are so cumbersome that the kids always needed help! 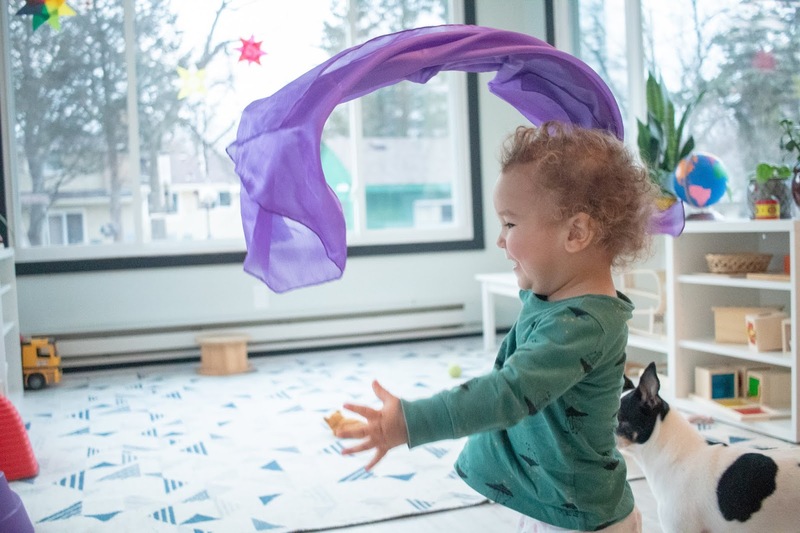 The play silks are so light and easy to use that this has become an independent activity for them. 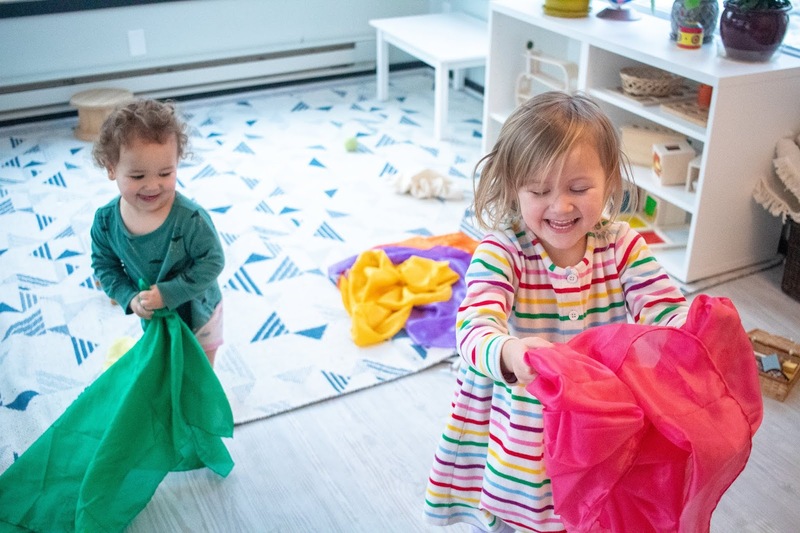 Our giant play silk is especially popular for forts. Decoration - and I personally love them because they look beautiful on the wall! We recently started storing them in a hanger meant for play silks and they add the perfect pop of color for our long winter days! 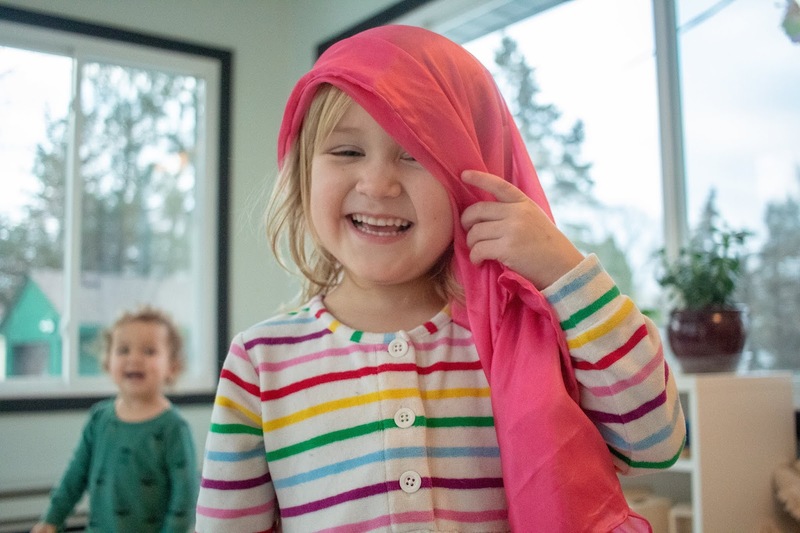 After throwing the play silks around yesterday and running around after them, Nora suggested we get dressed up in them and have a parade. We each were assigned an instrument and paraded around shouting and dancing. It was great fun. But, with their movement needs met, Nora and Gus started to slowly drift away into their own independent play. It was a lovely reminder how simple play can be and how just the right material can make all the difference in engaging both their minds and bodies! Do you have play silks at home or school? How do you use them? Are they well loved?